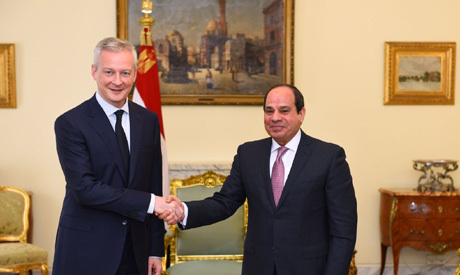 Egyptian President Abdel-Fattah El-Sisi met with French Finance Minister Bruno Le Maire in Cairo on Sunday to discuss economic ties and bilateral relations. The meeting was attended by Egypt's Minister of Investment Sahar Nasr and the French ambassador in Cairo. Egypt's presidential spokesperson Bassam Rady said that the French official conveyed greetings from French President Emmanuel Macron to his Egyptian counterpart, stressing his country's interest in strengthening the strong and distinguished relations it has with Egypt as a cornerstone of stability in the Middle East. 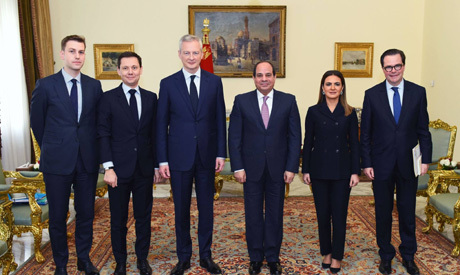 The French minister also affirmed France's appreciation for President El-Sisi's leadership, which has guided Egypt from difficult times to its current state of stability, praising the wise decisions that have led to positive economic development. The president expressed keenness to continue cooperation during the upcoming period to boost relations in all fields, including coordination and consultation on various regional and international issues of common interest, especially the current crises in the Middle East, whose repercussions extend to the Mediterranean region. They also discussed maximising cooperation in the sectors of health, renewable energy, transportation and logistics,. ُُThe President and Le Maire also discussed the potential of strengthening the partnership between France and Africa during Egypt's chairmanship of the African Union in 2019 in order to promote economic development in the continent. El-Sisi stressed the importance his country places on economic and trade cooperation with France, which could benefit from investing in Egypt's given its evolving business climate and the success of its economic reform programme. El-Sisi stressed that these positive developments in the economy makes Egypt a great candidate as a base for increasing French exports into Africa. The president praised the work of French companies in Egyptian national projects, such as the development of the Suez Canal axis and the new cities being constructed throughout the country. French Finance Minister Le Maire arrived in Egypt on Sunday in preparation for an anticipated visit by French President Emmanuel Macron later this month, Egypt's state-owned MENA news agency reported. Le Maire also met with Egypt's Prime Minister Mostafa Madbouly and economic portfolio ministers. The long-awaited visit by President Macron will be his first since assuming office in 2017. El-Sisi visited Paris in October 2017, where he discussed with Macron joint efforts to combat terrorism, the Middle East peace process, and the situation in Libya.